This year’s Frankfurt Prolight + Sound show will see the launch of three new innovative product ranges for loudspeaker manufacturer Void, these being indigo, Node and V2 digital processors. Indigo is the first generation of hi efficiency, compact loudspeakers designed specifically for aesthetically conscious venues (and DJs). First to be released is the Indigo 6 and Sub, which combine both Hi Fi quality sound with head turning looks every venue will want to be seen with. Node is a range of highly inconspicuous sub miniature stage monitors designed to produce a true point source radiation pattern by use of a dual concentric configuration. First to make a début is the Node 3, which has been designed for medium scale stage monitor duties that require a discreet yet sophisticated look such as high visibility broadcast stages and high profile corporate cliental. Further possibilities for use, if wall mounted, include down-fill in prestigious night venues and as part of the main system in smaller clubs as well as quality conscious mobile rigs. Advanced materials such as carbon fibre have been employed to minimise cabinet colouration and skim weight, yet still provide an enclosure with industrial strength properties. 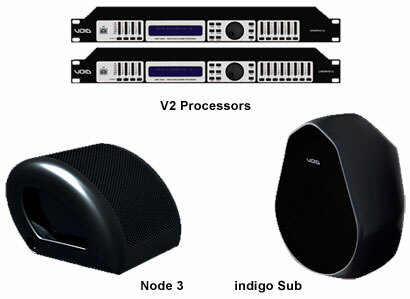 Void’s new V2 series of digital loudspeaker processors break the mould with unsurpassed bandwidth and features. All V2 processors use the latest multiple processor architecture and audiophile converters to deliver an unprecedented audio bandwidth of 5Hz - 45kHz. Fully featured studio grade compressors have been assigned to all inputs whilst transparent sounding limiters that make use of Read Ahead Detection provide maximum system protection on the outputs. For maximum user friendliness direct access menu buttons have been implemented along with split screen editing when multiple inputs or outputs have been selected. V2 processors will also ship with Live Link control software, which has been co-developed by a leading audio software design team for super-fast external control of up to 240 units.